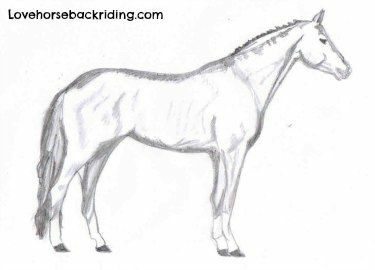 Completing horse sketches inspires us to gain more skill in drawing. Adding the subtle components such as shading add character, some individuality and depth to your drawings. Did you just land here? Scroll down and click on the "tutorial beginning" button to go back to the beginning to get started right. 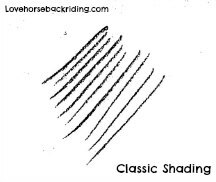 Classical shading is a series of parallel lines drawn at a forty five degree angle to fill the whole area to be shaded. The darker the shadow you want, the closer together you should draw the lines. Varying the type of pencil, angle of strokes, sharpness of pencil, and closeness of the lines (these are far apart to show the technique) will change the effect. Try exploring different variations on blank paper first. 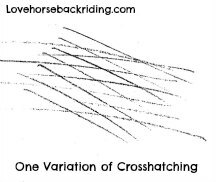 Crosshatching is when two lines intersect at different angles. It can be used to shade the points noted above. When the angles of the lines and intersection are very close it adds luster because there is still the white of the paper to breathe. Increasing the angle of the lines and where they intersect opens up more white space and adds a different effect. Again, try doing it different ways on blank paper first and see what works for your picture. Once you are satisfied with this part, there are just a few more details. For this horse you can see the lower legs on all four legs has been left unshaded which makes this horse appear that he has four white socks. You can keep the shading lighter for your sketching and final details by using less pressure on the pencil and/or less layers of strokes. Once you get your details you are finished! Horse sketches like this one will require lots of practice and experimentation. If you want, you can go back to the previous page or if it didn't turn out how you'd like, just try again by clicking on tutorial beginning. 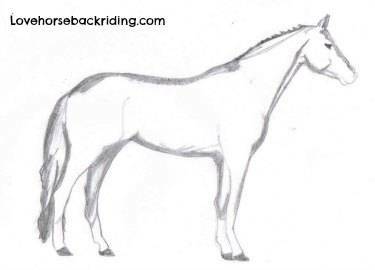 Leave this horse sketches tutorial to explore more drawing and fun horse and riding information!